Wow, October was a crazy month for us! We've taken today to just breathe. November looks to be a little busy, but nothing near like October was. The Kiln's been firing away getting some more stuff ready. Plus the holidays are coming!! Check out the Work groups, as some new items have been added. I'm still working out the logistics of the shopping cart, so if you have an interest in anything you see, please let me know via the Contact page, or email. 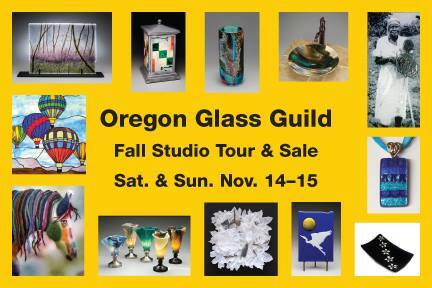 First up is the OGG Studio Tour and Sale. My garage studio is one on the Tour! Looks to be fun, and people can see what we do in our detached garage. Then we'll be at the Grout Elementary School Holiday Bazaar on November 21st. They reached out to us to ask us to apply for this juried event, so it should be interesting. Details to come. Then November 28th is the Hillsboro Holly Days event, 1pm-6pm. More information to come on that one as well. We also have an event at the beginning of December that I'm very excited about, that we were accepted for. More details on that one later on. Gotta run and check the kiln! !